It promised to be the weirdest auction ever held in Paris. 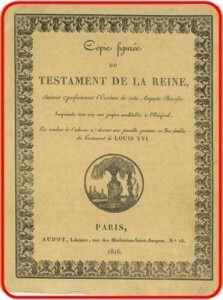 I am now speaking of the Peines et Châtiments d’Autrefois – Penalties and Punishments of Yesteryear – auction which would have been held this Tuesday (April 3) at the Hôtel Salomon de Rothschild at Number 11 Rue Berryer in the chic 8th arrondissement (district) of 812 objects of torture. 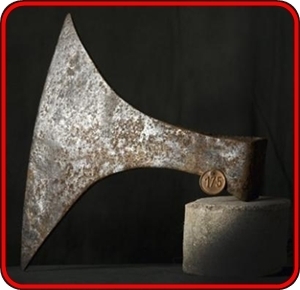 So virulent were the arguments and protests against this event that the auctioneer – Cornette de Saint-Cyr – in agreement with the owner of the objects have agreed to “suspend” putting the objects under the hammer for the moment. Great must be the disappointment for many because hardly ever before has a scheduled auction been met with such interest and excitement. The auctioneer’s catalogue was even sold out within 48 hours of going on sale on the internet. Also, from today (Saturday, March 31 until 9 p.m. Monday, April 2 the objects could have been viewed free of charge, but this too has now been cancelled. The true-crime writer in me scrutinized the objects on the auctioneer’s site, and, I must say, for someone who has written about to the foulest murders, even I doubted the wisdom of letting most of the 812 objects loose on the public. 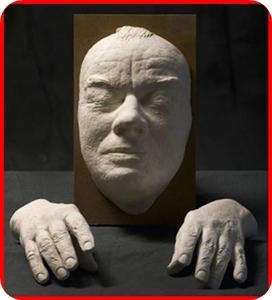 The objects belonged to Fernand Meyssonnier (1931-2008) who was a bourreau – executioner – for France from 1947-1961 in Algeria which was a French colony from 1830-1962, and who over the 14 years of his career chopped the heads off some 200 people. Let’s work this one out: Born in 1931, he was 16 years old in 1947 when he did his first execution, and with approximately 200 executions to his name he chopped the head off someone at a rate of one a month. True to the tradition that being executioner runs in families, in 1947 when Fernand Meyssonnier had started out, he had taken over from his communist father Maurice who in turn had taken over from a family member. Maurice, by the way, when he was not chopping off heads, served coffee and wine in his bar in Algiers. 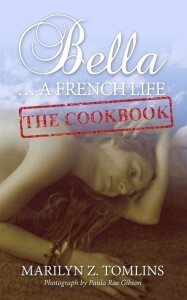 After Algeria, Fernand had set off for another French colony –Tahiti – and there he got married and fathered a daughter and returned to metropolitan France to live here peacefully in retirement. And as we now know to collect objects to do with punishment of criminals and/or political opponents, and to, in 1992, open the “Museum of Justice and Punishment” in Fontaine-de-Vaucluse where he settled. The museum was a financial disaster so he closed it and stored the objects in the basement of his house. Amongst the objects was a decapitated head preserved in a bottle. It is on behalf of his daughter that the auctioneers have now tried to sell Fernard Meyssonnier’s collection. Before I am going to tell you of some of the items which would have been offered on auction on Tuesday, I will let Fernand Meyssonnier speak. “I was 16, and my father asked me if I wanted to watch. He made me stand to one side so I wasn’t in the way. Then we heard the call to prayer from a mosque, and my father said it’s time. The guy came out flanked by two guards. They pushed him on to the plank. I saw the head go between the two uprights, and then in a tenth of a second it was off. And at that moment I just let out a sound like this – aaah! It was strong stuff,” he once said in an interview with a British journalist. Now about some of the objects. Number 784 : Estimated value €500 ($668 / £417). 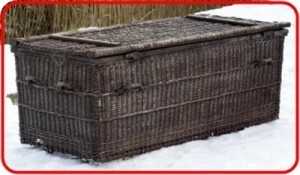 A lead-lined wicker basket for the body of a guillotined person. The head fell into a smaller lead-lined wicker basket. The basket 191 x 83 x 70 cm (75 x 33 x 28 inches) was big enough to hold three bodies. Number 509 : Estimated value €150 ($200 / £125). 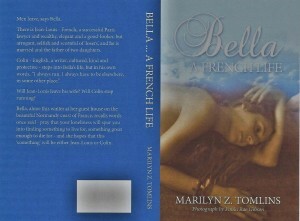 A copy of Marie-Antoinette’s Last Will and Testament. The copy was printed in 1816 and the Queen’s signature is very clear. Thrown in with the Testament is an old black and white postcard announcing her execution with the words Exécution de Marie-Antoinette (16 October 1793) Place de la Révolution. Number 658 : Estimated value €1200 ($1600 / £1000). 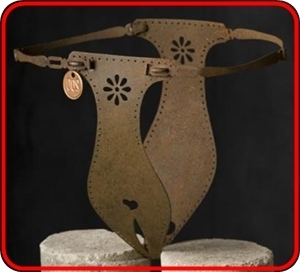 A chastity belt. Number 685 : Estimated value €500 ($668 / £417). An executioner’s wrought iron ax. Number 774: Estimated value €1500 ($2005 / £1250). 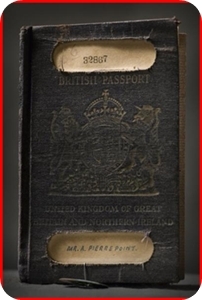 The passport of Albert Pierrepoint (1905-1992) perhaps Britain’s most well-known hangman. 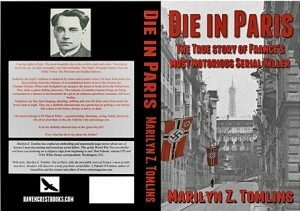 He hanged over 400 people of whom 17 were women. I recently wrote an article about one of them – Ruth Ellis. 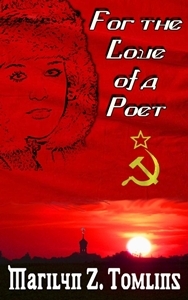 You can read it here; look for Love, Lust & Death on the Gallows. There are several visa stamps in the passport and some are for Germany where he had to go to hang 202 Nazi war criminals. Number 637: Estimated value €4000 ($5345 / £3335). A wrought iron instrument for crushing the hands. Among those who did not want the auction to be held was Frédéric Mitterrand, France’s Minister of Culture. Few believe that the auction would now ever be held. I agree, but I do think that the objects should be put on display in a museum. 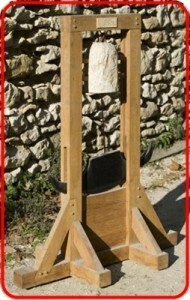 A last word: nowhere in France can one view a real guillotine. 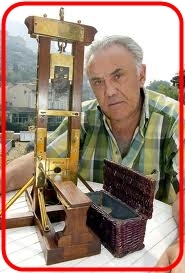 When I was writing my book Die in Paris about the Second World War French serial killer, Dr Marcel Petiot, I wanted to see a real guillotine for myself, but as this was not possible, I had to be satisfied with seeing a small model. It was the one in the Carnavalet Museum. If the original auction was canceled, what ever became of all these items? NO, it is not a fake. And my comment dates are correct. Remember there are time zones. Where can I find how much all the items were valued? 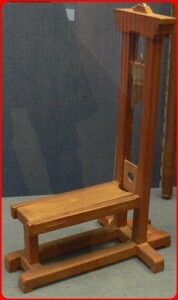 Alas, the guillotine that was at the pub is likely a fake. P.S. The comment dates are incorrect. Today is April 12, 2012. My previous post, above, was made on the 11th. There seems to be an authentic Revolutionary-era guillotine at La Guillotine Pub (52 Rue Galande) in Paris. Photos seem to show the same machine that was auctioned on 15 June 2011 for 223 056 Euros (see http://www.estimart.fr/actu/?p=51). Another great article, Marilyn. Man’s ingenious inhumanity to man never ceases to fascinate me. Definitely items for a museum. The Chamber of Horrors like the one in London. Marilyn, I agree with you that these objects belong in a museum. 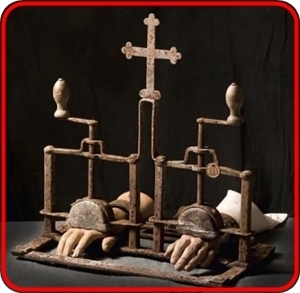 I noticed that the one for crushing hands has an orthodox cross on it…….I suppose this one was used if you were caught stealing.